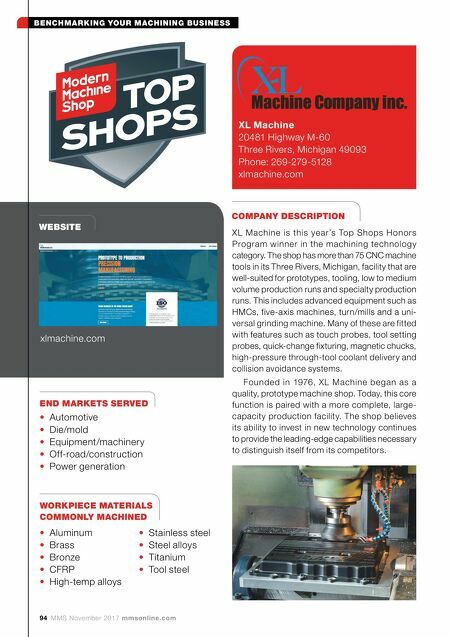 BENCHMARKING YOUR MACHINING BUSINESS mmsonline.com MMS November 2017 95 Each of XL Machines' more than 20 HMCs can hold tolerances of ±0.002 mm. They are used to perform both true four-axis machining and "4 + 1" positioning work. 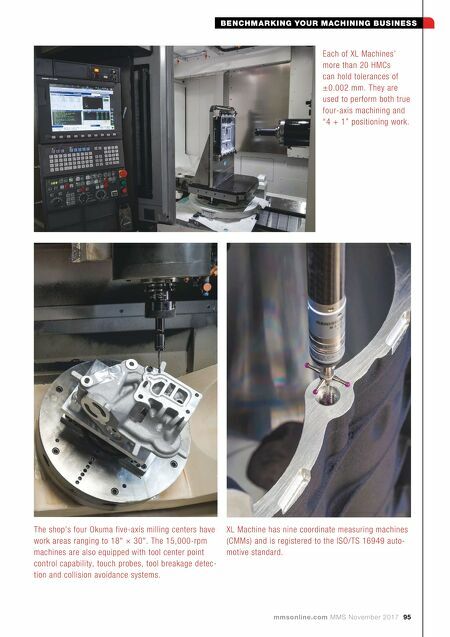 The shop's four Okuma five-axis milling centers have work areas ranging to 18" × 30". The 15,000-rpm machines are also equipped with tool center point control capability, touch probes, tool breakage detec- tion and collision avoidance systems. XL Machine has nine coordinate measuring machines (CMMs) and is registered to the ISO/TS 16949 auto- motive standard.